Even within the rarified coachwork ethic, it takes more than hand, eye, template and tool to create a unique motoring conveyance like this superbly-executed and technologically-advanced high performance coupe. First, there is a translation from passion -- a passion for the automotive arts borne not only of familiarity with elevated driving experiences, but also of a personal fondness for the special forms and sculpted shapes that have imparted timeless notions of speed. Motifs that have for more than a half century signified heritage, tradition, enduring affect. Qualities attached to great automotive marques. Ferrari, Maserati. Porsche. Mercedes-Benz. Alfa Romeo. Duesenberg. Packard. Chrysler. It is no coincidence, either, that the lineage of many of these automobiles is inseparable from the coachwork tradition, wherin a combine of like-minded craftsmen within early carrozzeria ("carriage works" in the Italian) orchestrated a process of assemblage--chassis, body, engine and driveline, wheels, upholstery, intrumentation and appointments-that would culminate in the final production: a unique motor car built to harness the dreams of owner and builder alike. Again, these houses bear legendary names of their masters: Brianza, Pinin Farina, Touring, Zagato, Viotti. That valued heritage continues today in the Oakland, California, shops of Moal Coachbuilders. 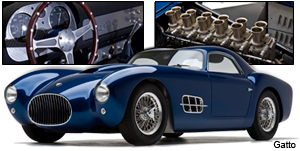 To create this remarkable vehicle, coachworks master Steve Moal and owner Bill Grimsley have engaged many of the same processes that guided the carrozzeria masters of the early 20th Century. Grimsley, a retired investment manager, knew he wanted a distinct vehicle that would amalgamate a number of ideas regarding form and function, convenience, performance and efficiency. An experienced collector, amateur sports car racer and long-time motorsports aficionado, he knew he would like to own and drive a distinctive vehicle that was highly responsive (stiff and with the handling characteristics of a thoroughbred race car), light and lithe (like a Lotus), one that would incorporate front-mounted power and driveline from an iconic engine that bespeaks not only a special aesthetic--but stands at the ready to deliver vigourous horsepower (the Ferrari 250 GTO motor--one long-associated with the Ferrari Testa Rossa sports racer). The vehicle would have to have amenities that in his experience were missing in more traditional sports models: air conditioning, comfortable seating, a fail-safe cooling system, bold, easy-to-read instumentation, a sure and equitably-matched manual transmission--and the most effective braking system available today. This would be no lawn-locked show car, but a ready-to-rumble backcountry sprinter. He would also seek the rare unification of design simplicity with functional accoutrements. Unique door handles, cabin and engine compartment vents, filler cap, grille, wheels, body accents. This would be a cumulative challenge that would broach no afterthoughts, add-ons or post-construction modifications. Ever-present during the evolutionary phases of this coupe's three-year construction, Grimsley remains in awe of the Moal artisans and craftsmen who've created and assembled the vehicle. Everything from the smallest components like door hinges to the Borrani wheels to the substantial chassis itself. He pays tribute to this team for their creative and attentive workmanship, lavishing particular praise on Moal metalsmith Jimmy Kilroy, who so adroitly fashioned the aluminum bodywork as well as many of the exterior metal touches--the Mercedes-like fender vents, the exquisite circular grille, so reminiscent of early Maserati Grand Prix racers, the subtle fender creases that again impart a sense of motion and balance, the graceful, integrated topside cabin vents nestled ingeniously in the small rooftop bubble crevice. His only lament is that when the car is finished much of the team's exquisitely-crafted handiwork will be hidden 'neath body, cabin and motor compartments.